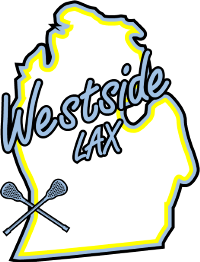 West Side Lacrosse is a family owned and operated travel lacrosse program that competes in large tournaments in the summer and fall throughout the Midwest. We currently have 8 teams: U-10, U-12, U-13, U-14, 3 High school teams (2021, 2020 & 2019) plus an Alumni team. Our players are from all over West Michigan including: Holland, Zeeland, Grand Haven, Grandville, Spring Lake, Hudsonville, Jenison, Saugatuck and Muskegon, encompassing 12 different school districts. The club is entering its 12th year and has seen tremendous growth. Just 8 years ago we had only 1 team. Due to the success of our teams and the growth of the game we have expanded our enrollment and our travel. Our High School teams have been our most successful in terms of wins and losses and tournaments won, but our primary objective is to have fun. Our next priority is to coach and play the game with Class and Respect. We strongly believe in the lessons the game has to teach us as individuals and in terms of being part of a team. Our greatest achievement has been bringing players together and creating friendships between players and parents who otherwise would only have been competitors. We feel that the wins and losses will be forgotten (mostly), but the friendships and shared experiences will last must longer and settle much deeper. With that said, we have also been fairly successful on the field winning over 12 tournaments in the past 4 years. Many of our players go on to play College lacrosse and some have even won National Championships. We are proud of all of our players; but my greatest reward is when they become coaches. We have been fortunate that so many of our players have returned to the game to give back to their sport and community. West Side is a pay to play program. Our dues vary by level, but we’ve had to increase dues every year since we began. This is caused by increase in tournament fees, added practice times, participation in more tournaments and the need for quality and dependable coaching. West Side is still among the least expensive travel programs in the state. We feel we offer as much, if not more than most other programs, but we do not want to continue to increase our dues. We believe lacrosse is an inclusive game and money should never be the reason an athlete doesn’t play. West Side Lacrosse is looking for local companies to help offset the costs for our players and their families through sponsorships. We are asking for a minimum $250.00 per company. This is what your involvement and investment would yield for your company. Our hopes are to raise enough money so we can offer 1 full scholarship, and at least 2 partial scholarships for deserving players, and maintain or lower dues for years to come. West Side currently has over 140 players in the program. That does not include the family and friends that travel and attend our games. That’s easily over 500 people who visit our website weekly in the summer. We feel this is a great opportunity to support a local athletic program that believes in its message of Class and Respect, while also promoting local businesses along the Lakeshore. Thank you for your time and consideration. Please feel free to contact me personally if you have any questions or concerns. If you would like to sponsor West Side for the 2018 season, please contact Murle Greer to confirm. Email your company logo to me and mail in the West Side Sponsorship Form with payment. Thank you in advance.